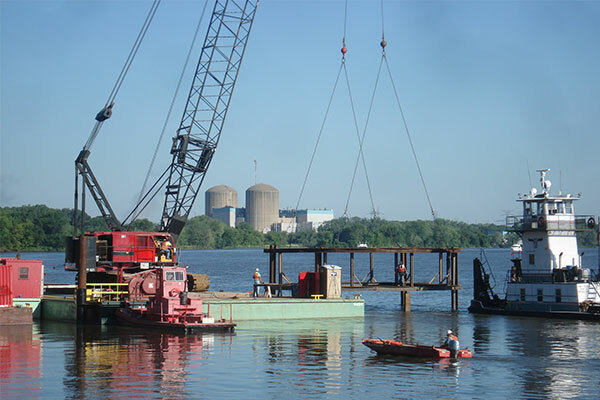 Kraemer completed two successive award-winning projects for the U.S. Army Corps of Engineers (USACE) St. Paul District, which were the first contracts awarded by the district using the Design-Build delivery method. Work on the navigation improvements project included extending the guidewall approximately 875 feet upstream and modifying the river flow to reduce the outdraft condition at the lock and dam. The new guidewall was constructed using 24 inch pipe pile that supported a cast-in-place concrete wall and that was divided into eight monoliths. The wall further protected at the upstream end with a 50-foot diameter concrete filled sheet pile cell. The guide wall was further protected by construction of an earthen dike that tied the new wall to the existing USACE dock facility. Modifications to the channel included dredging and pricing of sand and capping the sand material with rip rap. Kraemer’s scope on the new improved embankment system was to construct a portion consisting of outlet structures, embankments, and several spillways. Unique challenges to the project included strict environmental restrictions regarding the protection of Bald Eagles, certain tree species, and mussel beds as well as no road access requiring all construction and material to be accessed by water using barges only.